How do women defy the odds and get their career back on track after a break? How do women manage the mama mafia at the school gate? Can women really have it all – a successful career and a rewarding family life? Does overseas experience really accelerate your career in Australia? How do you recreate your career after a setback? 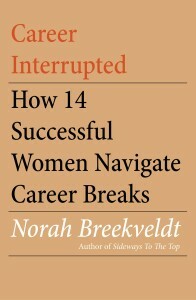 Norah Breekveldt’s latest book “Career Interrupted: How 14 Successful Women Navigate Career Breaks” profiles fourteen high-achieving women who talk openly about their challenges in carving out a successful career after a break. These women come from all walks of life — from battlers to privileged backgrounds, from large corporates to small business, from professional services to the community sector. Several women had children and talk candidly about what it’s like to be in the throes of mother guilt and come out the other side; some are expatriates who returned to Australia to rebuild their career, yet others had to re-establish their career after a misstep. These stories are interwoven with the latest research from thought leaders around the obstacles and pitfalls in leaving the workforce for a time, and include practical and proven strategies to overcome these hurdles. What have been the common findings from the amazing women profiled in Career Interrupted? Their insights are captured in the THRIVE model at Work-life balance – the impossible dream?